Hola Lexicans! Today I am back with another book review, this time for Don't Even Think About It a really good book which I finished yesterday. I also have a post about the Truth Behind Blogging lined up, which I hope will be really relatable, so watch out for that. Don't Even Think About It tells the story of 22 classmates who begin to develop the ability to hear what people are thinking about, after their unwanted flu shot. Suddenly they can hear every thought from the people around them; parents, teachers, crushes, enemies and each other. However as fun as it may sound, this superpower soon leads to them learning dark secrets that have been hidden for ages. I think the thing I loved most about Don't Even Think About It were the characters. Of course, we didn't meet all 22 affected in depth (we met around 6 fully), and I believed in all of them as if they were real people in MY form. Throughout the book, you began to get to know the characters better and I couldn't help feel sorry for them in certain places, happy in others etc. which is the point when I really know I'm into a book. Also, I love how the author put a very original voice to something that is in many books. Another thing I found extremely interesting, although it did take a while to get used to, was the book was narrated as a 'we', so there would be phrases like 'We weren't always freaks.' I've never read a book with this narration, so at first I found it a little weird, particularly as every character had a point where they were named rather than 'I' so the reader never found out who the final person in the 'we' was. It showed develop of the characters relationship as you watched them turn from different people into a 'we'. This book is also a very refreshing contemporary teen book and the style of writing reminds me very much of Rainbow Rowell's Fangirl which I read and reviewed pretty recently so if you enjoyed that I definitely think checking out Don't Even Think About It is worthwhile. 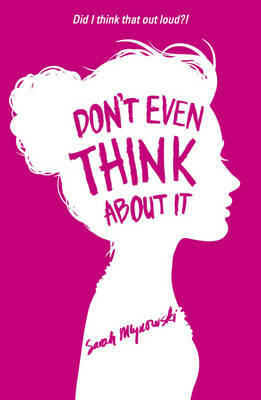 AND GUYS THERE IS ANOTHER ONE (called Think Twice) YAYY I NEED TO READ IT!! I hope you liked that review and Don't Even Think About not getting this book (aren't I punny, ahaha, no, ok). Make sure to check back soon for my Truth Behind Blogging Post which should be up in a couple of days. Oh wow I really wanna read it XD I love mysterious books..Would you consider it a mystery? Cool review and can't wait for your new post!